LA Times Reviews "Dream of a House: The Passions and Preoccupations of Reynolds Price"
Read below the great review in the LA Times of Dream of a House: The Passions and Preoccupations of Reynolds Price. The book is edited by Alex Harris and Margaret Sartor, with photographs by Alex Harris. Photographs from the book are currently on exhibit at Duke University's Rubenstein Library. The book is published by George F. Thompson Publishing and the Center for Documentary Studies at Duke University and distributed by the University of North Carolina Press. "Dream of a House Tours the Eclectic Home of Writer Reynolds Price"
After author and scholar Price died in 2011, Harris, a dear friend, set out to document the celebrated Southern writer’s eccentric and art-filled home. Harris’ photographs appear alongside excerpts from Price’s work — novels, memoirs, plays and collections of poetry and essays that he wrote throughout his lifetime. Taken together, the photographs become a kind of portrait in absentia; in conversation with Price’s own words, the book is a surprisingly intimate glimpse into the private, domestic world of one writer’s life. What can things — furniture, everyday objects, art — really tell us about someone? If this book is any indication, plenty. What Price chose to surround himself with tells us about his obsessions, his affections, and perhaps even his perception of himself. In an interview excerpted in the book, Price said that he surrounded himself with “images of what I have loved and love and worship — worship in the sense of offering my life and work to them.” For this writer, on every wall, inspiration. 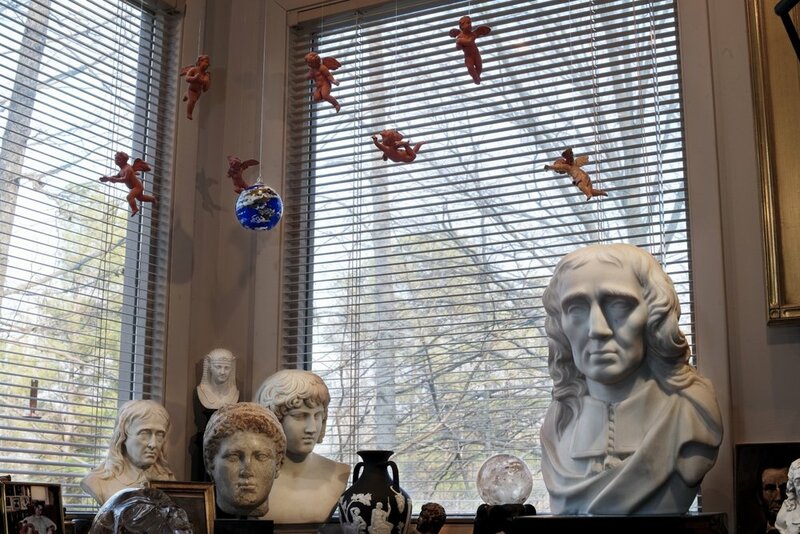 Marble busts, ceramic angels, Christian and queer iconography — Price’s home is eclectic, maximalist and lovely. It is also, despite his absence, touchingly lived-in. The placement of a favorite pair of salt and pepper shakers on a windowsill, just so; the stack of books on a table, or a painting propped up against a wall — his home was unique, but also familiar in its idiosyncrasies and imperfections. In a particularly compelling detail shot, a crucifix shares mug-space with toothbrushes and clippers, a thimble and thread with other detritus of day-to-day life. “Dream of a House” pays tribute to Price; it also awakens the observer to one of Price’s own observations.